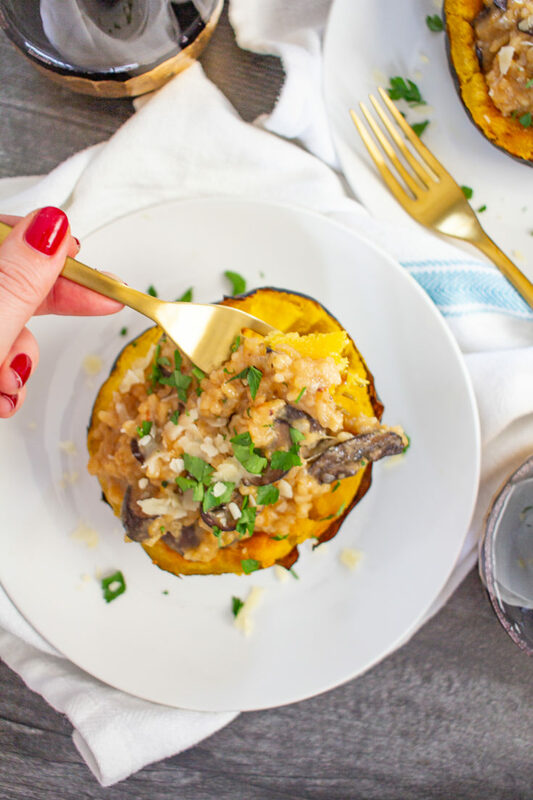 Risotto Stuffed Squash is a hearty vegetarian meal made with roasted acorn squash filled with cheesy risotto. This meal is something that I have been making for years. 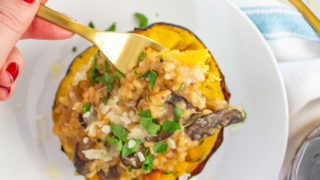 I first shared my risotto stuffed squash recipe on this site 7 years ago and am finally updating it with better photos. 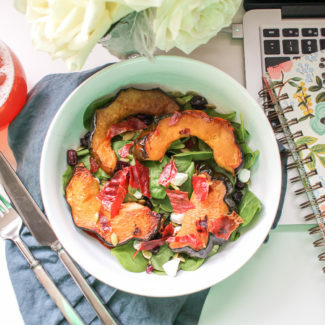 I love this meal because it fills me up and keeps me feeling full, which isn’t always the case with a vegetarian meal. The combination of mushrooms and squash give me more than a complete serving of vegetables, and the carbs in the risotto help to keep me from full. 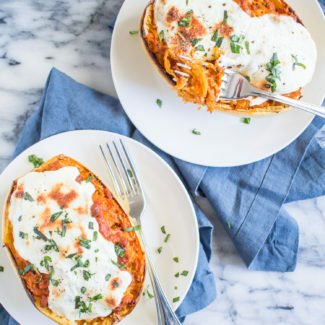 The process of making this meal is easy, and it takes only 20 minutes active preparation time, and under an hour total. 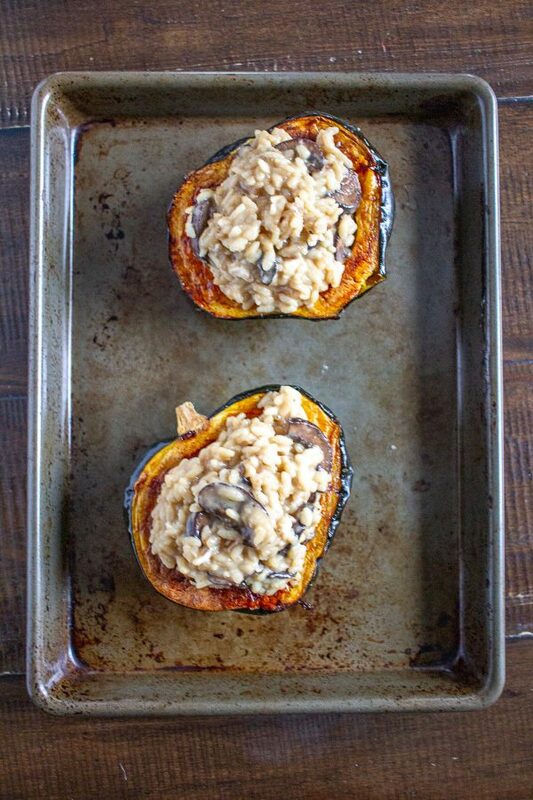 Get the squash roasting in the oven first, and after about 30 minutes start the risotto. 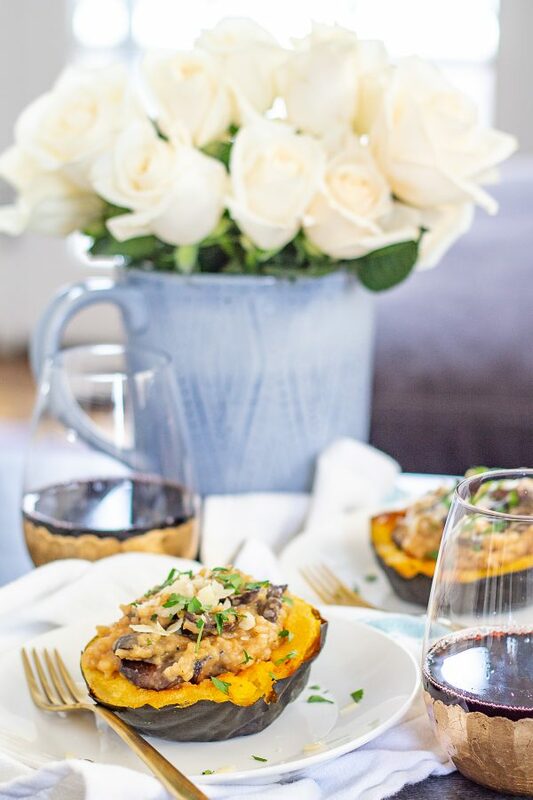 I like to use acorn squash for this recipe because it is just the right size for a single serving. Once you scoop the seeds out of the squash it leaves just the right amount of room for the risotto. 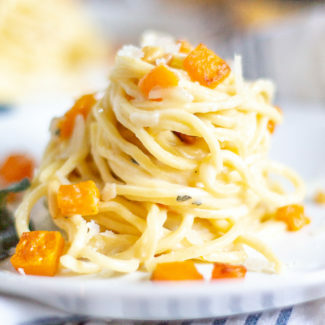 You could also use a small butternut squash, you just might want to scoop out some extra space for the risotto. 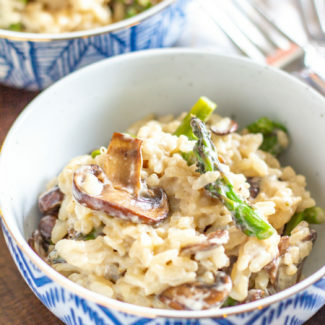 The thing that makes the risotto extra special is the mushrooms which are sauteed in sherry. The sherry mushrooms plus some goat cheese and Parmesan make the risotto a rich cheesy treat. Mushrooms and sherry are one of my favorite flavor combinations, I also use sherry and mushrooms in one of my most popular chicken recipes. I know that making risotto might sound intimidating, but it is surprisingly easy, and it can be made in just 20 minutes. You can find detailed step by step instructions for making risotto here. The trick to getting risotto to cook quickly is simple: heat the broth. 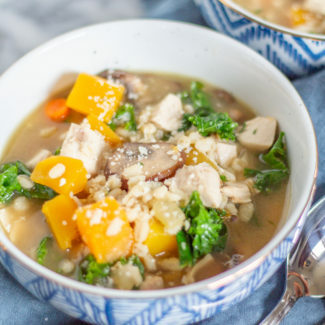 Adding cold or room temperature broth will slow down the cooking process while adding steaming hot broth will make it possible for you to cook risotto in under 20 minutes. 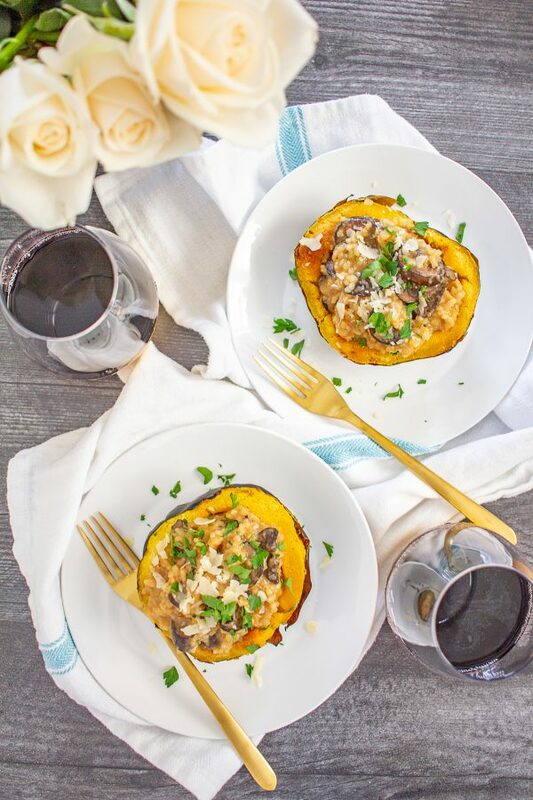 Risotto stuffed Squash is a hearty vegetarian meal made with roasted acorn squash filled with cheesy risotto. 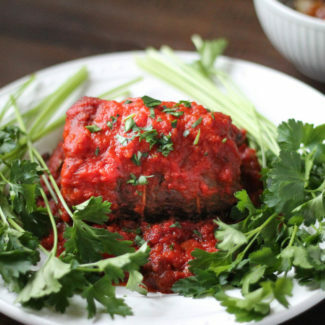 It's a delicious and filling meal that can be made in under and hour. Heat your oven to 350 degrees. Use a sharp knife to carefully slice each squash in half. Scoop out the seeds with a spoon. Then generously brush the inside of the squash with olive oil. 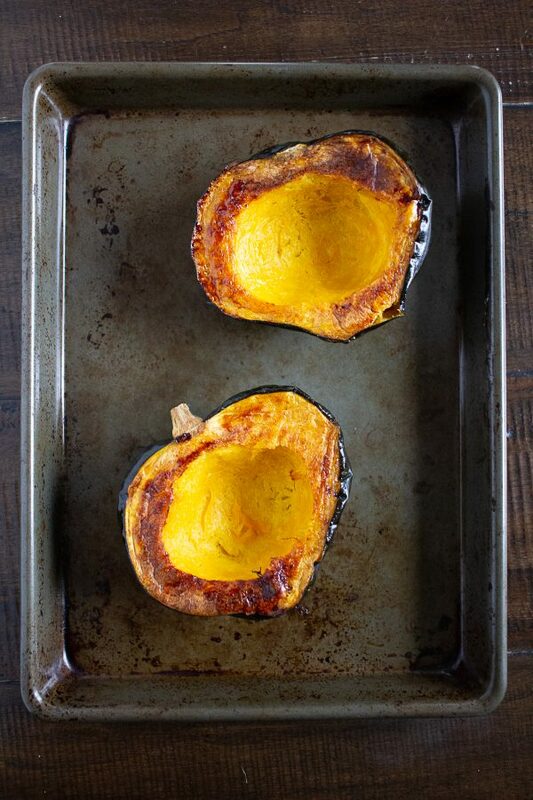 Place the 4 squash halves on a baking sheet with the inside of the squash facing down. Bake for 30 minutes and then flip the squash over. Once you have flipped the squash, prepare the risotto. Heat the broth in a pot until it is lightly steaming but not bubbling. In a separate pot, melt 1 tablespoon butter in a pot over medium heat. Then add the risotto and stir. Stir frequently until the risotto browns very slightly. Then add just enough of the warm broth to submerge the risotto. Reduce the heat to medium-low and let simmer. After about 5 or 6 minutes the risotto will have absorbed all of the broth. Stir the risotto with a wooden spoon (stirring with a metal spoon transfers heat unevenly) and add more warm broth to submerge the rice again. I find that risotto is fully cooked after the broth has been added 3 or 4 times. Repeat this until the risotto is tender. While the rice is cooking, prepare the mushrooms. In a skillet melt 1 tablespoon butter over medium heat. Then add the chopped shallots and sliced mushrooms. Season generously with salt and pepper. Saute for 5 minutes then add the sherry. Cook medium-low stirring frequently until all the liquid has been absorbed, and the mushrooms have browned. Set aside. Once the risotto has almost absorbed the final addition of broth, add the shallots, mushrooms, and goat cheese. Stir until the cheese has melted. 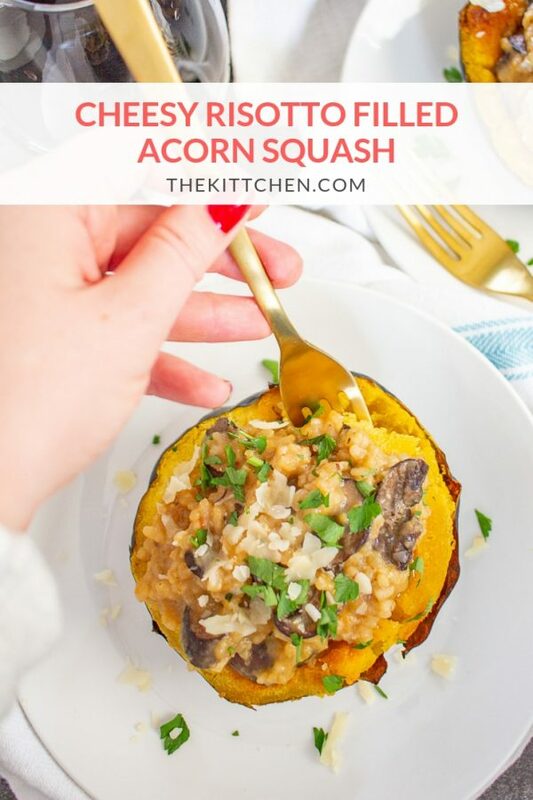 Remove the squash from the oven and spoon the risotto into the center of the squash. Sprinkle with the Parmesan and serve.